After reading this post on Hack-a-day, I went to the local MicroCenter to see what all they had to offer in a brick-and-mortar store. I remember when Parallax and RadioShack had joined together and while the new availability had made it easier to get started with microcontrollers, the most common expression recalled is one of sadness at the general disarray of the parts cabinets. Thankfully Microcenter seems to have done Sparkfun right. Read on for my initial impressions of Microcenter’s offerings and a full review of my first Arduino kit, the Sparkfun Inventor’s Kit. If you are interested solely in the review, scroll down to the “Finally, the review!” section below. Online Only stores and Brick and Mortar stores intersect, a bit of history. A lot of online-only stores have made offerings into brick and mortar retail stores with varying amounts of success, unlike retail stores going into online offerings which anyone would say has been a huge success and convenience. Unfortunately, the DIY/Hobbyist market hasn’t seen such a success and for the most part has remained largely an online-only affair. Several years ago, Parallax announced that they would start offering some sensors and kits for sale at Radio Shack. After hearing the news, I was tentatively excited however after seeing their initial offering, I don’t think Parallax was done right by Radioshack. They were given half of a disorganized “parts drawer” and a couple of pegs to offer hanging merchandise. Despite Parallax’s attempt, the move into retail ultimately floundered. It is my belief that if Radio Shack had given Parallax’s parts offering a bit more shelf space and Parallax had made more of an initial offer in Parallax’s own packaging, they might have been able to make it more successful. Instead, Parallax’s limited offering (around 10 sensors and the “What’s A Microcontroller” kit) and Radio Shack’s shoddy mismanagement of the parts bins where the sensors were stored served to bury the Parallax name in the forgotten corners of the store. Although there was a post several months ago with a shot of custom Parallax retail packaging, I can’t find the link now, nor did any searching reveal any information. Several other companies watched the Parallax and Radio Shack situation unfold and took notes, now it’s time to evaluate another initial transitional offering from online only to online/brick-and-mortar offerings. 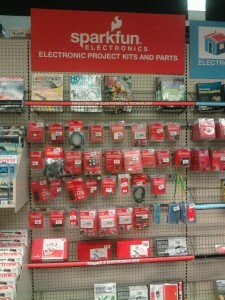 Sparkfun Electronics has been well known in the Arduino community with their extensive offerings online. Chances are, if there’s a sensor out there, they have it either in kit form or as a complete pre-fab module. When I heard that they are making an offering through Microcenter, I was thankful that I lived near Microcenter. Using Parallax and Radio Shack as an example of a failed attempt, I went to Microcenter to scope out their product offerings. I was very pleasantly surprised. Sparkfun’s initial product offering outpaces Parallax’s offering by a significant margin as shown in the image below. Not only do they offer a Getting Started kit (reviewed below), they also offer a wide variety of parts and shields for the Arduino platform. You can see in the above photo that they have a lot to offer. 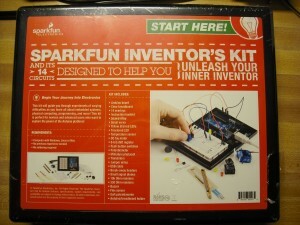 From my estimates, they had the Arduino platform as well as the Inventor’s kit and several other non-Arduino projects. They also offered a wide array of sensors and components as well as several Arduino shields in kit form. Some of the shields they offer is the Arduino motor shield, Arduino Prototype Shield with microSD card reader and the Arduino Joystick Shield. Their component offering is equally impressive with a multitude of sensors, both serial and parallel character LCD displays, breadboards and modules. Something I saw that I plan on getting later on is a dedicated 3.7V Lithium Polymer charging module with battery. This module will charge off a USB port and will keep an Arduino running for 50 hours according to the box. Having something like this is a big bonus when working on embedded hardware. They also offer several kits like the X-Bee modules kit (which is probably my next purchase) which contain everything you need to get started. You get a USB to Serial converter board, two X-Bee modules and an X-Bee to Arduino interface shield. Their RFID kit also has the same level of thought put into it with the necessary adapter board, the RFID sensor and sample RFID cards to experiment with. In addition to their parts and components, I found something I had been wanting personally. They had tool kits available in store. The kits were ranged according to skill level (easy, medium and complex) with the complex kit featuring a multimeter and soldering iron, while the medium kit only offered the soldering iron. As the user’s skill level progresses, they can add to their kit as needed. One thing that seemed to stand out about their Arduino offering is that they introduced three flavors of Arduino. The Arduino Uno (which comes in the Inventor’s kit as well as individually), The Arduino Mini (and the related FTDI programming module) and the Breadboard Arduino (Arduino made on breadboard rather than the standard PCB board). For those of you asking about cost, this was one of my concerns as well. In my previous experience, anything in a brick-and-mortar store is usually more expensive. I did a side-by-side comparison with my phone as I priced random components and kits and I found that the cost at the store was pretty much dead on, only varying by a few cents. 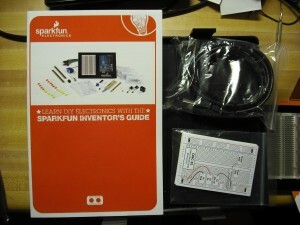 And without more blathering about Sparkfun and Microcenter, finally we get to the review. The kit I picked up is the Retail version of the SparkFun Inventor’s Kit (SIK)which has everything one would need to get started with the Arduino and electronics. I won’t enumerate the full list of materials in the box, however I will present several pictures as shown below. Most of the kits on the market have a hinge at one end however Sparkfun’s kit has a completely detached cover meant to be removed. This presents the bonus of not eating up twice the kit’s floor space on your desk. Inside the kit comes a nicely packaged assortment of parts in the right hand compartments and in the top compartment. More on those in a bit. 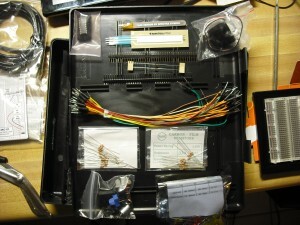 The left hand compartment contains several pin jumpers for breadboarding and Arduino connections and the center large compartment holds the USB cable, the circuit flash cards, the Arduino in its own box and the mounting plate and breadboard. 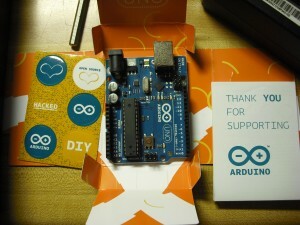 The Arduino Uno comes in its own little box, prepackaged and QC’ed from Italy where the Arduino was built and designed. 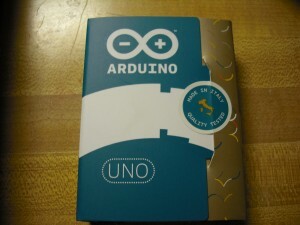 Along with the Arduino Uno comes a handful of stickers and a little pamphlet with more information about the Arduino. 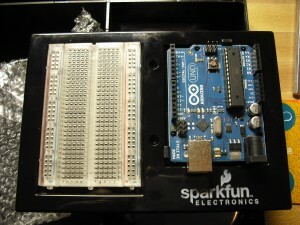 The mounted Arduino and breadboard on the included Sparkfun mounting plate. This gives the user a good and stable place to work with the Arduino and the sample circuits in order to understand the Arduino’s capabilities. 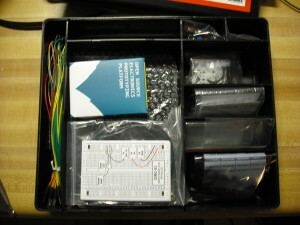 The kit also includes a small booklet that has several circuits and sample code to get started. The booklet (pictured) contains several circuits and is intended to be used with the flash cards together in order to guide the novice through building the circuits and becoming familiar with the Arduino. The flash cards each contain a circuit diagram that correlates to how the components should be connected to the Arduino and the book contains sample code with a brief explanation of how the code works. The book is targeted at new users to the Arduino platform however I quickly came to the conclusion that this kit is not targeted at beginners to electronics. Coming from the “What’s A Microcontroller” world that explained everything including the basic 101’s of electronics, this may be a bit off-putting for some however with an understanding of some of the basics, this may serve to bridge the gap between building basic passive electronics projects and more advanced digital electronics projects. Unlike the “What’s A Microcontroller” kit, there is no complete guide to the command reference included in the kit however the Basic Stamp and the Arduino both have extensive community support. The Sparkfun Inventor’s Kit appears to be well stocked with a typical selection of components fit for a beginner’s kit and will make a good start in working with the Arduino, even if you have never had any microcontroller experience. While I can’t recommend this kit as a complete beginner’s guide to electronics, any newbie should be able to perform additional research to locate the answers they seek. This is not a completely offline course but I do not consider this to be enough of a deterrent to stop from recommending the kit. I feel that this kit will be a great addition to any electronics bench and will help anyone with even the most basic electronics experience get started with the Arduino.